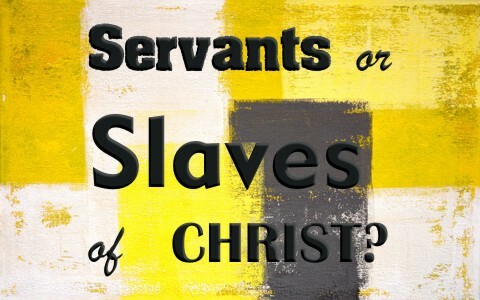 Does The Bible Teach We’re Servants Or Slaves Of Christ? We are told to be servants of one another, but are we servants of Christ, or slaves of Christ? (Acts 28:30-31 ESV) And he stayed two full years in his own rented quarters and was welcoming all who came to him, preaching the kingdom of God and teaching concerning the Lord Jesus Christ with all openness, unhindered. The original Greek says “proclaiming,” rather than “preaching,” so ESV is closer in the example above. More often than not, the NASB has been found to be closer to the original Hebrew, Aramaic, and the Greek manuscripts, and that’s important. There is no doubt that when the King James Bible was written, the use and popularity of slavery was rapidly declining and was now seen as being evil. Thanks to many godly men over the years, attention was brought to the inhumane, cruel, and unfair treatment of slaves. The Christians began to argue, rightly, that all men and women were created in God’s image. They all deserve to be treated with dignity and respect, and the color of a person’s skin doesn’t make a person less or more of a human being. God is no respecter of persons, and neither should we be, so with that in mind, when the King James Bible was written, the word slave was not a popular choice with the translators, even though the word “slave” was in the original Greek manuscripts. The stigma that went with the word slavery was something they didn’t want in the Bible, and so for the most part, when you read the word “servant,” you’re probably reading a word that should have been translated into “slave,” because often, the word is not from the Greek word for servant, “diakonos,” but from the Greek word “doulos.” The word servant seems so much softer than the word, slave, and even in this nation, the word servant would be preferred over slave, because of the extreme abuse of slaves, particularly in the south, but for much of America’s early history, slavery was almost widespread. That’s much of the reason that King James translators used “diakonos” (servant) instead of “doulos” (slave), but the difference when we’re reading Scripture is enormous, as we shall see. The word servant (diakonos) is where we get our word deacon from, and simply means a person who waits on others, or at the most basic level, a waiter. That difference means a lot when you read Scripture, and that’s what we examine next. Most people think being a servant is better, but not really. Think about this. A servant could be fired. He could be replaced. She was only paid for what she did. They were considered hired help by the family, so they were never as close to anyone family member at all as they would be a slave. There might have been exceptions where a servant cared for children and the children grew close to the servant, but that servant was never really a part of the family like a slave could be. But you might ask, “Is being a slave better than being a servant?” Who is closer to the family; a servant or a slave? In the first century world of the Roman Empire, slaves were much closer to the family than we might think. For one thing, slaves lived with the families; servants finished their work and went to their own home. The slave slept in the family’s house, they ate their food, they cared for their children as well as the adults, and they were more loyal than a servant who could overhear secrets but be trusted to keep them. Not so with a servant. A servant’s loyalty was only as good as the money they were paid, but a slave was not paid, so their loyalty was absolute. Their master had the power of life or death over them, and some ran away, but that was not the norm because if a slave resided in a home, at least they had a means to survive, and survival in the first century was no easy task which is the reason that life spans were considerably shorter. The number of times we read the word “doulos” is always in relationship to God or Christ, but never are we slaves of a fellow believer. That’s where the word “servant” is useful, although we don’t serve one another for money, but we are not ever to be anyone’s slave. Although we tend to still be slaves of sin that is something that we’re at least working on. If we look at our direct relationship to Christ, we must remember that He bought us with His own blood, therefore He owns us, and we are His servants, yes, but we are also His slaves, but of course, not in the sense of being forced to obey. In most translations, Roman’s 1:1 says, “Paul, a servant of Christ Jesus, called to be an apostle, set apart for the gospel of God” (ESV) but in the NASB, the actual word for servant is the word “doulos” and it reads, “Paul, a bond-servant of Christ Jesus” and a bond-servant is close to that of a slave, but one that can earn their own freedom in some cases. James 1:1 is much the same way as in the ESV it reads, “James, a servant of God and of the Lord Jesus Christ” but in the NASB, “James, a bond-servant of God and of the Lord Jesus Christ,” much like in Romans 1:1. Here are a few more examples where the NASB correctly translates it “slave” rather than what most translations had, “servant.” These include Romans 1:1; 1st Corinthians 7:22; Galatians 1:10; Ephesians 6:6; Philippians 1:1; Colossians 4:12; Titus 1:1; James 1:1; 1st Peter 2:16; 2nd Peter 1:1; Jude 1:1 and Revelation 1:1. Each of these verses uses the correct word, slave, and not servant. That’s what the author, the Holy Spirit, intended. The authors certainly knew the difference between servant and slave, but my point is not to make us believe that we are only servants of Christ. No, it is more than that, because He sought me, He caught me; He bought me; He taught me; what I ought be; and so, it’s all about Him, and not about me. Slave or servant, I am glad I am His and He is mine! Read more on this topic here: What Does It Mean to Be a Slave of Christ? Based on John 15:14-15 (I read and reread it in several translations including Young’s Literal Translation), rather than servants or slaves, I believe that we as believers in Christ are now His friends. I consider you a friend and greatly respect your teaching, so if you feel I’m off-base on this, please let me know.